Dancing in the Rain: You Bought WHAT?? I sometimes start having it before I even get out of a store. It drives Mark NUTS when he catches me eyeing the contents of our cart as we stand in line to check out. He knows I'm thinking, "Hmm, maybe we don't really need ALL of this." I am a very careful shopper. 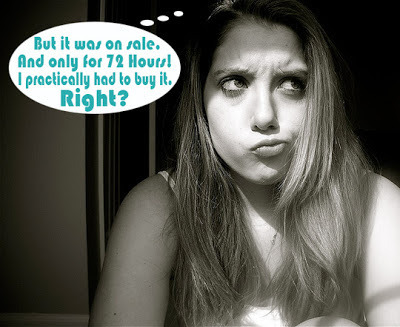 I'm not a couponer, but I rarely pay for anything at full price and I'm a label/tag reader. I like to make sure I'm getting the best value for the money. This is something my mother taught me. Do you know that grocery stores often try to trick you into thinking you're getting a good deal on something they've put on "sale", when in fact another size of the same product is actually a better value? True story. I catch them doing it all the time. But it's only because I take the time to check the labeling. Stores get away with doing this with everyone else who don't stop and really look. Even with my uber practical and pragmatic shopper side, there have been purchases I've regretted, or I regretted my husband making. Mark is NOT as practical and pragmatic as I. 1. We both regretted buying my FIL's Toyota Supra when it threw a rod which punched a hole through the engine block. Dealing with that was a nightmare of epic proportions. 2. Speaking of cars, although we didn't purchase it, a Buick we acquired was pretty much a silly thing we ended up just passing on to someone else. 3. Mark worked for EXPO Design Center for a few years before we moved to Washington. Where Home Depot will help you build your house, EXPO will help you decorate it. One day Mark decided to buy a whole bunch of high end lighting fixtures for super cheap. He figured he could sell them for a very nice profit. It never panned out, and we lugged those damn things around for YEARS. 4. My daughter's crib. She never slept in it. Total waste of money. 5. Stick-up lights. I've done this more than once, trying different ones that come out, because I need extra light EVERYWHERE, but they use too many batteries which need replacing too often. Better to just grab a flashlight. 6. One of the first edition Kindles. Both Mark and I thought it would be fantastic for me and my bad eyes. Not so much. Yeah, I could make the print as big as I wanted, but the contrast was terrible, so I still had to work too hard to read it. I very sadly packed it up and sent it back to Amazon. Now though, I have a Kindle Fire and I love it. 7. A Topsy Turvy tomato planter. 8. Bar stools with backs. This is something you do not want to do if you have little kids who will twist and swivel in them, banging the backs on the counter and gouging them all to hell. 9. Half of the scrapbooking supplies that are collecting dust in their organizational caddy. 10. 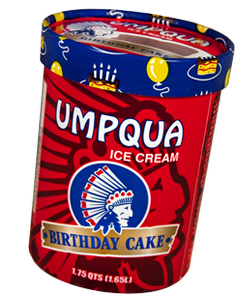 The Umpqua brand Birthday Cake ice cream currently sitting in my freezer, because its deliciousness is calling to me.